At the bar I find an old pair of over-ear headphones. They’re muted grey, one earpad missing. The cord is a tangled mess with a pertinent layer of the grime that collects on beer bottles and white sneakers. Perfect, because I left my own pair at home and I’ll need some to make it through the final late-night train I have to take. On the way, I listen for the first time to World of the Waking State. The phones work but they’re glitchy. The bass comes out as fuzz, the jack keeps escaping its hole. At moments I can’t parse which sounds come from Steffi and which come from the friction inside the auxiliary jack of my broken iPhone. The sounds Steffi plays with welcome this. Her world is full of grit, and addendums of external disruption do little to distract from the scapes of movement that relentlessly fill Waking State to the brim. It’s often both open and claustrophobic, inviting in room for exploration while still building walls that lead listeners through a complex city labyrinth that enshrouds the entire album. Steffi’s process undoubtedly elicits curiosity. It’s not so much her rhythmic atmosphere - in fact, at most points that atmosphere is what will feel the most familiar to longtime listeners of old-school and contemporary techno. Take for instance “Meaning of Memory” and “Schools of Thought.” Here is where attention is most easily drawn to a beat, albeit one that feels uninterested in any corporeal motion. But the music is not cold, at least not definitively so. What inspires the most inquisition is the selection of noises Steffi curates here. Many synthesized sounds make themselves known through constant arpeggios and reveal themselves obviously as results of old, analog synthesizers or drum machines. Frequently though, they could be heard as a sampled sound from something like a quarter-inch plug being yanked from an outlet or a needle being dropped onto the turntable before a record has been set up. The sounds are ones that, decades ago when synthesized sounds were on the rise, would have been interpreted as futuristic. Now, though, they could be called a variety of antiquating terms from “old-school” to “lo-fi” and beyond. “Is it future? Or is it past?” The artist herself seems to treat this question with absolute deference. She regards the sounds with care, rather than expressing them as an aesthetic choice to make the music feel “old.” The listener can choose what to engage with and how, and at many times can allow their own surroundings to affect the way the music is consumed. It’s in this way that Steffi aligns herself so much with the contemporary school of minimalism more than anything else, especially anything dancefloor-oriented. A collector of sounds non-present and non-historic - her work reminds me of an interview with composer Paul Lansky. When asked about making “expressive” music with a computer, Lansky mentioned that “some pieces are like those buses in New York City that bow down to politely let passengers off and on, while others are moving trains which barely stop, and force you to leap on and off at your own risk.” Waking State falls almost completely into the former category. Its essence is open not only to interpretation, but to outlandish reconfiguration based on its surroundings. This is a headspace contradictory to most minimal and ambient electronic music from this year. Take for example any portion of Leyland Kirby’s Everywhere at the End of Time series, which is completely dependent on the medium of temporal space. It’s inaccurate to say an album like that “tells a story,” but it follows a temporal narrative in a way that Waking State never attempts to. And so the sounds brought into frame throughout Waking State are able to completely avoid the process of, as one would say, “getting old.” From the perspective of dance music - specifically from the perspective of calling the album techno - there’s an undoubtedly catchy pulse to how Steffi produces these tracks. It’s especially noticeable in the flow of one song to the next. Much, much like with her mix for Fabric earlier this year, Steffi concerns herself with the underlying pace of each moment as it flows into the next, rather than trying too hard to conceive a relationship between the trebles and melodies of each piece. When I get off the train, the relationship between the music and the city becomes more severe. My “new” headphones leak to me a steady stream. The busted bells of a paletero’s cart carry a similar rhythm to the deadly throb of “Kokkie,” an acidic and emotive standout moment on the album’s 57 minutes. The psychic jungle thrown into the mix on “Bounces of Nature” feels naturally disposed for the capita of a city center as I pass conversation and shouts. Steffi was raised by the sounds of crowded clubs, of private events that blossom shared experience. But this world - the World of the Waking State - is a place of the public sphere. It follows an indubitable march through streets and crowded places. There is nothing meditative about the repetitions here, instead they serve to decorate and flourish. In an electronic landscape over-saturated with dreams of separation, Steffi takes perfect pleasure in the integration of a city concentrate. Waking State uses relics of a future imagined to solidify a present moment. It’s a reflective action, looking directly into the eyes of how we once imagined a future for ourselves. It begs us to ask, how an image we once fantasized has come to be tangible in the heartache and the grit that surrounds us now. And, truth be told, it feels absolutely confounding. 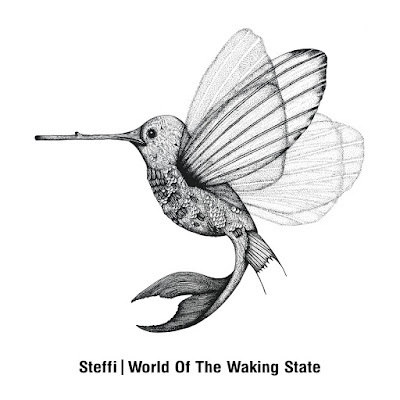 Listen to Steffi on bandcamp.